This lecture introduce on Reaganomics; a fix to the unemployment and inflation of the time. 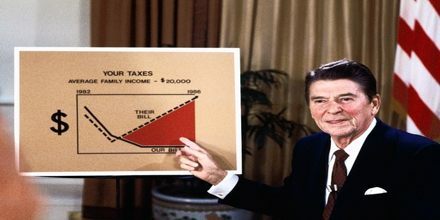 The economic policies of the former US president Ronald Reagan, associated especially with the reduction of taxes and the promotion of unrestricted free-market activity. Reagan + Economics = Reaganomics. It can reduce govt. spending; reduce marginal tax rates on income from labor and capital; reduce government regulation of the economy and control the money supply to reduce inflation.